Nestled amidst an ancient rainforest, on a private island fringed by white sandy beaches and emerald waters lies Pangkor Laut Resort. Set along the Straits of Malacca, three miles off the West Coast of Malaysia, discover a piece of paradise 2 million years in the making. Of the island's 300 acres, only a fraction has been developed to house this peaceful luxury resort and its Estates. Declared a paradise by the late Pavarotti and previously voted 'Number One in the World' by Condé Nast Traveller; here, wooden buildings blend seamlessly into the forest, walls curve around foliage, and roofs open up to allow trees to continue on their journey to the sky. Resting beneath the shade of forest giants as old as the land, this island is not only home to one of the world’s premier resorts but also to variety of wildlife. Long-tailed macaques and oriental pied hornbills perch in the branches above while white-bellied sea eagles soar overhead and large monitor lizards sunbathe on the island’s rocky outcrops. Nature is respected here, almost revered and it rewards visitors in ways that simply need to be experienced. 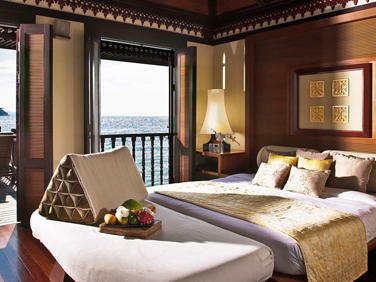 Comfort, warmth and contemporary elegance find a home on the private island of Pangkor Laut. This one-of-a-kind resort nestles comfortably into its jungle island habitat, offering guests beautifully appointed luxury accommodation set high amidst the hills, nestled within lush gardens or resting on stilts above the tropical waters surrounding the island. Our villas' amenities include comfortable bedding, a writing desk, a powered safe, a large open en-suite bathroom with an oversized bathtub and two vanity units, and an outdoor verandah or balcony with sun loungers. 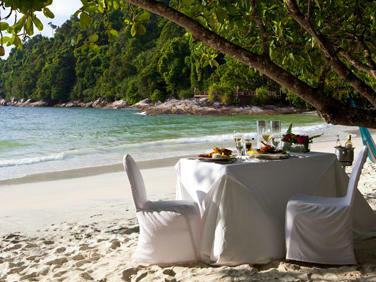 Dining at Pangkor Laut Resort is a celebration of the region's culinary arts. Here, nature draws on all of her bounty to play chef just for you. Every meal on this isle is a feast flavoured by the history of the land; where the finest local ingredients are transformed by our internationally trained chefs into a memorable range of experiences. Absolute freshness is their mantra and these masters of the culinary arts, well versed in the creation of both Western and Asian cuisine, do all that they can to ensure that the path from nature to our tables is as short and as carefully managed as possible. The Spa Village at Pangkor Laut Resort is a unique retreat that extols the healing cultures of the region. Malaysia, with its diverse history of people and cultures, and vast abundance of natural resources, provides the backdrop for health rituals that are amongst the oldest in the world. The abundance of Malay, Chinese and Indian practices makes this the ideal setting for complete rejuvenation. Programmes here combine physical and spiritual health and well-being, and are based on one of four umbrella concepts: Rejuvenation and Longevity, Relaxation and Stress Reduction, Detoxification, and Romance.